Arrival at Cochin Airport and transfer to hotel. Check in at Hotel and proceed for Athirapilly sight seeing Enjoy the waterfalls or proceed for optional activities like Tribal Village Visit, Guided Jungle Trek, etc - (on direct payment basis). Overnight stay at Cochin. Arrival at Cochin and transfer to Munnar . Munnar is 1800 mts above sea level and also the place of South India's highest peak (Anamudi-2695 mts). 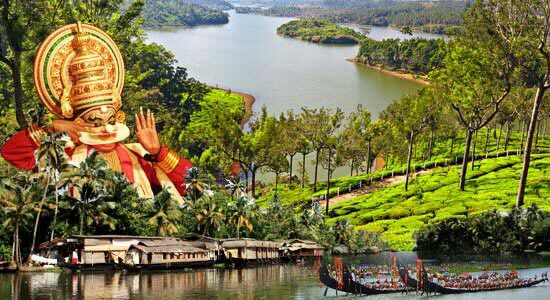 On the way visit Valara, Cheeyappara waterfalls & Tea Plantations. On arrival at Munnar transfer to Hotel. Check in at Hotel. Afternoon visit Rajamala (Eravikulam National Park - open as per the directions by the forest authorities ), the best place to see Nilgiri tahr (Hermitragus Hilarious)- the mountain goat of South India & Tea Museum. Evening have a short visit at Munnar town. You can see the beautiful tea estates like a green paradise. Overnight stay at Munnar. After breakfast proceed for sightseeing. Mattupetty dam ,echo Point, Kundala Dam,Pothamedu View Point, Blossom Park etc are some of the highlights of the sightseeing. Shopping & overnight stay at Munnar. After Brake fast check out from Thekkady and transferred to Alleppey. Check in at hotel and Proceed to Local sight seeing.Alappuzha has always enjoyed an important place in the maritime history of Kerala. Today, it is famous for its boat races, backwater holidays, beaches, marine products and Coir industry. Alappuzha beach is a popular picnic spot. The pier, which extends into the sea here, is over 137 years old. Entertainment facilities at the Wijaya Beach Park add to the attraction of the beach. There is also an old lighthouse nearby which is greatly fascinating to visitors. over night stay at hotel.